Dr. Ronald Goldstein is currently Clinical Professor of Oral Rehabilitation at Georgia Regents University College of Dental Medicine in Augusta, Georgia, Adjunct Clinical Professor of Prosthodontics at Boston University Henry M. Goldman School of Dental Medicine, and an Adjunct Professor of Restorative Dentistry at The University of Texas Health Science Center at San Antonio, Texas. Dr. Goldstein has presented continuing education courses at more than twenty universities and lectured at over 600 dental meetings in the United States, Canada, South America, Australia, the Orient and throughout Europe. He is a contributor to ten published texts and author of the text Esthetics in Dentistry. He is co-author of other texts, including Bleaching Teeth, Porcelain Laminate Veneers, Porcelain and Composite Inlays & Onlays, Complete Dental Bleaching, and Imaging in Esthetic Dentistry - all published by Quintessence Publishing Company. His best-selling consumer book for the public entitled Change Your Smile, now in its fourth edition, is also published by Quintessence, and has been read by over 1,000,000 people and has been translated into twelve languages. Dr. Goldstein served three years as resident dental consultant and produced over seventy consumer-oriented programs on all phases of dentistry for the popular television feature "P.M. Magazine". He has also been featured in twenty-nine different dental-related video productions consisting of over forty clinical teaching hours. His film "Anterior Fixed Restoration Esthetic Principles," made for the American Dental Association, was the winner of the 1982 John Muir Medical Film Festival Award for Dentistry. Dr. Goldstein is a fellow of the American College of Dentists, The International College of Dentists, an Honorable Fellow of the Georgia Dental Association, and an honorary member of O.K.U. Scholastic Fraternity. He is also a member of the American Association for Dental Research and The International Association for Dental Research. In 1986, Dr. Goldstein was elected to the National Academies of Practice as a Distinguished Practitioner. In 1992, the American Academy of Esthetic Dentistry awarded him the first Charles L. Pincus Award for his contributions to Esthetic Dentistry. The same year, he was awarded the Outstanding Contribution to Cosmetic Dentistry Award from the American Academy of Cosmetic Dentistry. He is co-founder and past-president of the American Academy of Esthetic Dentistry, a past-president of Alpha Omega International Dental Fraternity, and the fifth District Dental Society in Atlanta, Georgia. He also is a member of the American Academy of Fixed Prosthodontics and a past member of The International Academy of Gnathology. Dr. Goldstein is married to Judy, and the father of three dentists and one physician. He enjoys photography, travel and fine wine. 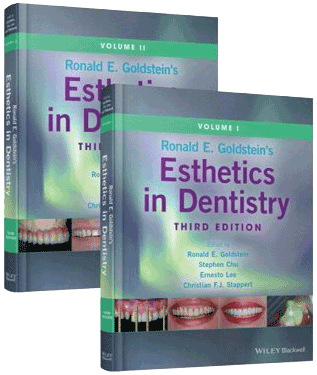 Ronald E. Goldstein’s Esthetics in Dentistry, Third Edition provides a thoroughly updated and expanded revision to the definitive reference to all aspects of esthetic and cosmetic dentistry, from principles and treatments to specific challenges and complications. Provides a current, comprehensive examination of all aspects of esthetic and cosmetic dentistry. Change Your Smile has proven to be an effective marketing tool for dental practices over the past 25 years. This completely revised and updated 4th edition is even more patient friendly and the most economical resource available for educating and motivating your patients. Purchase "Esthetics in Dentistry: Volume 1"
Purchase "Esthetics in Dentistry: Volume 2"